(Nanowerk News) In electronics, nothing works without transistors: they are the fundamental building blocks on which the logic circuits in our computer chips are based. They usually consist of silicon crystals, doped with other types of atom. One Swiss/Austrian research team (TU Wien, the University of Vienna, the University of Zurich, IBM Zurich) has now succeeded in developing a transistor that functions in a fundamentally different manner and consists solely of a single molecule. Instead of three electrodes, as in a conventional transistor, this switch molecule only requires two. The new nanoswitch has now been presented in the specialist journal Nature Nanotechnology ("Field-induced conductance switching by charge-state alternation in organometallic single-molecule junctions"). A single organic molecule with a molybdenum atom in its center acts as a switch. "The key feature of a transistor is that it can assume two different states," explains Robert Stadler from the Institute of Theoretical Physics at TU Wien (at the start of the project he was still working at the Department of Physical Chemistry at the University of Vienna). Depending on which state the transistor is in, it either allows current to flow or not. A conventional transistor made of silicon crystals therefore has three contacts: the current is supplied by one of these, and is able to flow into the second one; whether this actually happens or not depends on the voltage applied at the third contact, which is known as the 'gate contact'. In order to accommodate ever more transistors in an ever smaller area, transistors have continued to reduce in size over the last few decades. This has drastically improved efficiency in electronics, but does, however, bring with it ever greater technical problems. With conventional silicon technology, physical limitations are encountered as a result. "With extremely small crystals you no longer have sufficient control over the electronic properties, particularly if only a small number of dopants remains and the gate's insulating layer allows increasingly more leakage," explains Stadler. "However, if you switch from crystals to organic molecules at the nanoscale, you then have new opportunities to change the transport characteristics." At the University of Zurich, chemists have therefore synthesised organometallic molecular structures endowed with individual metal atoms of iron, ruthenium or molybdenum. 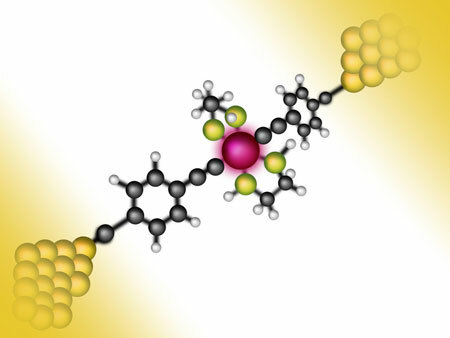 These designer molecules, which are only around two and a half nanometres long, are then carefully connected using two gold contacts at the IBM research lab in Rüschlikon before voltage can be applied to them. For one of the molecule types tested, which has a molybdenum atom placed at its core, some quite remarkable properties were observed: similarly to a silicon transistor, this molecule switches back and forth between two different states, which differ by three orders of magnitude as regards their conductivity. Complex computer simulations were required in order to understand the underlying process; these were carried out by Robert Stadler and his doctoral student Georg Kastlunger at the Vienna Scientific Cluster (VSC). This allowed the mechanism to be decoded at a quantum physical level. "Directly on the molybdenum atom there is a certain space which can be occupied by an electron," says Robert Stadler. "The amount of current that can flow through the molecule at a certain voltage depends on whether or not there is actually an electron occupying this space or not." And this in itself can be controlled. If the space is occupied, relatively little current will flow at a low voltage. At a higher voltage, however, the electron can be dislodged from its special place on the molybdenum atom. As a result, the system switches to a new state with conductivity improved by a factor of around a thousand, causing a sharp increase in the current flow. Both a switching and selection process can therefore be carried out via the two gold contacts, between which the molecule is fixed. A third electrode, as is usually required for a conventional transistor, is no longer necessary, which simplifies the wiring process significantly. The technology itself, however, is still too expensive to put into mass production for commercial computer chips. This is why the experiments were carried out at low temperatures and in an ultra-high vacuum. However, IBM are already working on designs to incorporate several of these molecules in nanopores on a silicon chip, so that they function under normal environmental conditions at room temperature. "This would be simpler and our theoretical methods would undoubtedly be suited to such systems, too," states Stadler with confidence. "Perhaps organic molecules with integrated metal atoms can lead the way to ultra-small switches for new storage systems; in any case, there is the potential for exciting applications, particularly since the omission of the third electrode allows for unrivalled integration densities."